Lower Yuba River – The Lower Yuba is sitting around 1600 cfs, which is a great flow for salmon and steelhead to move up river. I have been seeing school of salmon moving up river for over a month now and heard of the first adult steelhead being hooked this last week. I think if the flows stay this high it is going to be a great year for the Lower Yuba. I have not been out on the river lately but talking Ryan J. who was out earlier this week fishing has been fair to good with most fishing coming on nymphs. The egg bit should get going around mid September but with these good flows mid August to mid Sept there is going to be some early steelhead hooked I am sure. Lower Sacramento River Trout – Flows out of Keswick dropped from around 1200cfs to 10000cfs this weekend. I guided from Barge Hole to Bend Bridge on Saturday and fishing was fair. Areas that had been fishing didn’t hold fish like they did before the flow drop. It is always tough fishing the river the day of a flow drop but considering that fishing was pretty decent. I would expect fishing to get good again after a few days and fishing will only improve over the next month. The word on salmon is that there is a bunch of fish in the river but they are moving up stream fast. I have seen salmon up and down the river but most guys are struggling to catch fish. So maybe an early egg bite this year. Lower Sacramento River Stripers – Flows dropped to 7700cfs at Ord Bend. Striper fishing has been really good. We have been hooking really good numbers of fish in the 3-7lb range and having shots at 20+lb range on most days. Fishing both sinking and Intm. lines and smaller clousers seems to be the ticket. With salmon traffic being high it is important to know when and where to go to find feeding fish. Fishing should continue through August into mid September. Fishing can get a bit tougher when they decide to drop the flows for the fall though. Lower Feather River – Flows in Low Flow section are 2500cfs, this is very high considering most years it is 600cfs. The river channel of the low flow is more then capable of holding a flow of 2500cfs so it does not have the characteristics of a “blown out” river. 2500cfs is a much more “normal” flow actually for the river channel the low flow moves through. The high flow is flowing at 5500 cfs, this is pretty high for the high flow. Now with the high flows coming down the low flow a lot of the salmon are moving up through the high flow and into the low flow and not getting held up in the outlet and high flow. My guess is that the steelhead are moving up river quickly as well. Both these flows should change by October, but I think the low flow is still going to be higher then usual this year due to issues involving a fire earlier this year in one of the generators/pumps. I am going to try to get out and float the low flow in the next few weeks to check things out. Reports to follow but expect a good and early steelhead season on the Feather. Beer Report – So I have been drinking some really good beers…granted they have all been from Sierra Nevada. I went through a case of the new Beer Camp release and was a bit disappointed, I guess I shouldn’t say disappointed but just not totally impressed. The 3 beers that are part of this release are an IPA, Belgian Style Black IPA, and an Imperial Red Ale. None of them really jumped out at me as amazing, they were all good, but not great. My favorite would have to be the Belgian Style Black IPA as it had a pretty unique flavor. I have always thought the Beer Camp releases are pretty hit or miss, some good some OK and some have even been bad. I also was lucky enough to get a bottle of the limited release “Barrel Aged Ruthless Rye” which is Ruthless Rye aged for 3 months in bourbon barrels…I have not tried this yet but I am pretty excited, and have some pretty high hopes for it. I am thinking this week I may pop the cork on this baby. 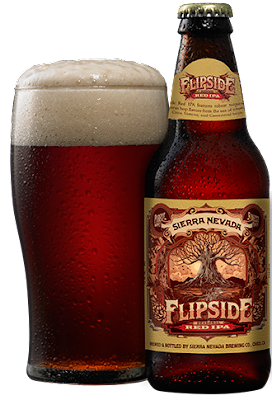 Also I am excited for the coming release of a new seasonal brew from Sierra, Flipside Red IPA, which will be coming out this late summer/early fall. Sports Report – The Giants are bad. Like 16 games back and in last place in the worst division in baseball. One nice thing about this is that the bandwagon is empty and only true fans remain. I still watch every night and have been overall accepting of where we are as a team…injuries, lack of production from key players, and pitching that has not delivered are hall marks of this season. That said there are some positive signs and I will watch to the last game. Curious to see how we handle Boston as they come in this week for a inter-leauge home stand. The Irish open the season ranked between 8-11 on various poles which to be honest a is a bit high…apparently no one who votes or ranks has watched Tommy Reese run the football…tough to run the spread with a small slow white guy. We will see what we are made of week 2 at Michigan. I am pumped though for the season. I think we have some good young talent and I am confident in our ability to get back to the BCS…maybe not the championship but at least a BCS game. 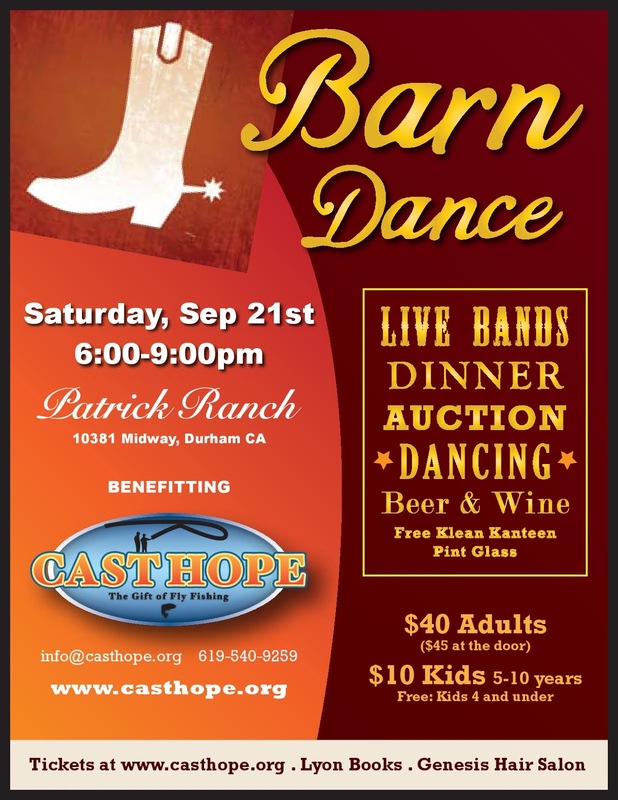 CAST HOPE - Check out the 2nd Annual Cast Hope Barn Dance coming up on Sept 21. If you are in chico this is a blast of an event. 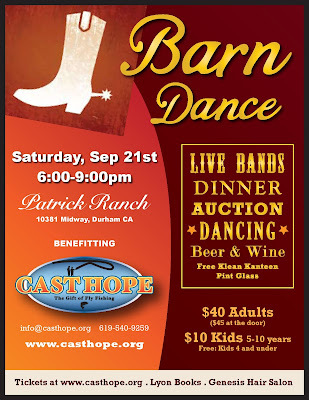 Great food, Great Beers, Amazing Auction items (flyfishing and non fly fishing), dancing and bands! Jan. 2-12, 18-20, 25, 26. Lower Yuba River - Egg Bit is best late sept-mid October. Oct-Feb is best for trout and steelhead. Lower Feather River - Fall Steelhead is best Oct-November and with flows through the low flow hovering between 1500 and 2500cfs it may even start getting good by early september this year. Butte Creek - Open Nov 15-Feb 15. The creek is Very very low so fishing won't pick up until we get some good rains, fishing is usually best mid December through mid Jan.
* keep in mind these are general descriptions and all rivers are subject to weather and flow changes. If you have a specific question or want to know more about a fishery in greater detail feel free to shoot me an email.